Wood floors are some of the most beautiful and warmest floors you can have in your home. And not only are they beautiful, but they're a good investment too. Homes with wood flooring have proven to have a higher resale value and sell faster than comparable homes without wood floors. Also, with some of the newer types of wood floors that are available, you can handle the installation yourself! Wood floors now come in a variety of types, species, and finishes so you can find the right floor for your taste and budget. In this tutorial, you'll learn more about solid wood and engineered wood flooring, how they are constructed and where in the home they should and should not be used. We'll also review the relative hardness of different wood species used in flooring. This is important when considering scratch resistance of the floor. Solid wood flooring is fabricated from 3/4" thick solid wood and has tongue and groove sides to join the boards. Some manufacturers make a thinner version that is 5/16" thick. 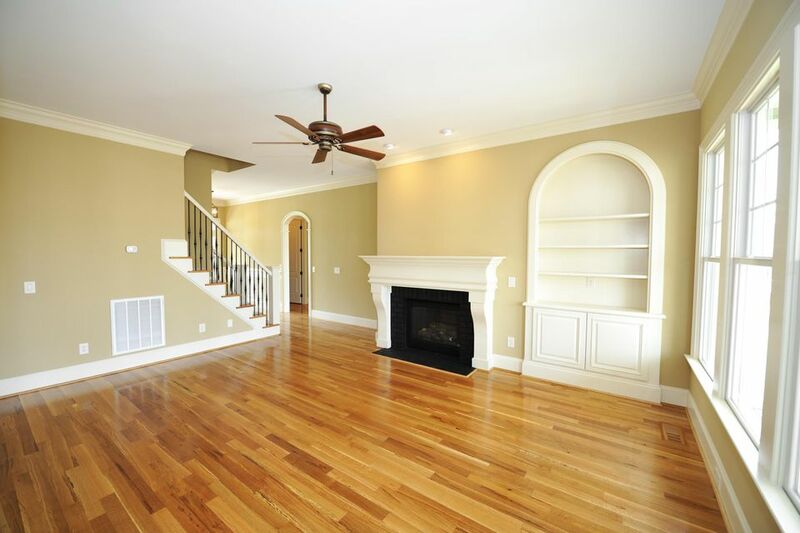 The main advantage of solid wood flooring is its ability to be resanded and refinished over many years. It is not uncommon for solid wood floors to last 50 years or more. These floors come unfinished or prefinished and in almost any wood species you can imagine. The main issue to consider with these floors is because they are solid wood, they are susceptible to expansion and contraction due to humidity changes in the home. To accommodate this movement, these floors are installed with a 5/8" to 3/4" gap around the perimeter of the floor along the wall and the gap is covered up by the baseboard and shoe molding. Also, 3/4" thick floors should not be installed in a below grade condition such as a basement, however, the thinner 5/16" wood floors may be used in that application. When installing a solid wood floor over new or recently washed concrete, be sure the manufacturer's recommendations on limits of moisture in the concrete are followed. Prefinished solid wood floors often come with slightly beveled top edges where the tongue and groove meet. Unfinished wood floors that are sanded, stained and finished on the job site will have ​smooth seamless joints. 3/4" wood floors require a specialized tool for nailing the boards together. The thinner 5/16" wood floor is installed using staples or glue. Engineered wood flooring construction consists of 3 to 10 layers of wood (typically 5). Each layer of wood is called a "ply" and they are oriented in different directions for strength, then glued under pressure. This construction technique results in a wood floor that is more stable than a solid wood floor. Stable meaning the floor is less susceptible to shrinkage and expansion movement due to fluctuations in humidity or temperature. These floors are also able to be installed directly over concrete and may be installed in below grade applications unlike solid wood floors. However, before installation is attempted over a concrete floor or a basement slab, vapor transmission testing must be done to determine if the level of concrete slab vapor emissions / hydrostatic pressure is acceptable. The problem of excessive moisture in a basement slab or concrete slab may be devastating to an engineered wood flooring installation. Another feature of these floors is that they come tongue and groove and can be installed non-floating, using nails or full adhesive spread, or some manufacturers offer interlocking engineered floating wood flooring that requires no adhesive. These interlocking floating wood floors are the easiest to install and require no specialized tools. The relative hardness of wood species is measured using what is called a Janka Hardness Rating. This test measures the force needed to embed a steel ball (.444 inch in diameter) to half its diameter in the piece of wood being tested, with the rating measured in pounds of force per square inch. So with this rating system, the higher the number the harder the wood. Wood hardness is important since one of the key considerations in selecting the species of wood floor your floor should be how much resistance the wood has to scratches and indentations. For example, if you have a dog with long nails then scratching the floor is a consideration and you should select a species with a higher rating such as hickory, maple, oak or ash.